Top trainer Matt Lovett of aps Fitness joins me on my MarlowFM radio show to discuss fitness inspiration and how to help people adhere to a specific fitness strategy or plan. We hear so many stories of those with good intentions but not staying the course – hear how Matt helps address this with his clients. Many thanks to MarlowFM for permission to use this show as a podcast. Here’s one of my favourite exercises, I just filmed it while away at Golds Gym in Venice Beach. See the full video by clicking here. You’ll see the mirror in the video. Having that positioned with the incline angle is perfect to check form and range of movement. If you have a wide cable machine at your gym, you probably don’t have the angled mirror, but still give it a go – you’ll love it, I’m sure! Here is my full chest workout, based on the ABC7 System that I use myself and recommend to others. There are seven exercises shown, with options for each depending on equipment availability. Full video – press here. For the full details of this, my workout C, on the Workout tab of this site – and the full System is available on the Shop tab. Thanks to Golds Gym in Venice Beach for the location and facilities for the video. One of my top arm exercises is the Cross-Body Hammer Curl. It’s on my group of biceps exercises, but it’s also considered a forearm movement as it works the brachioradialis – the muscle on the top edge of the upper forearm. This is exercise A42 in my ABC7 System. This is often the final exercise for me, and that was the case today – so I’m pretty drained, and the grimacing in the video here isn’t acting! An area of the body that is sometimes missed in training is the obliques, or side abs. These muscles do two motions – twisting the upper body and leaning the upper body sideways, both with lower body locked solid. This machine is for the first of these movements, but rather than lock the lower body, it locks the upper body – while twisting the lower part. The effect on the body is the same. See the video example here. A key point is to lock the upper body – and this is done by pressing the chest into the pads – then ensuring there is no movement across the chest during the exercise. The seat has different positions depending on flexibility and range of movement, try to use the maximum position or build up to it over time. It’s always one side at a time, don’t be tempted to go further than one-side-max to central and then return. Going further uses momentum, and detracts from the value of the exercise. There is a kneeling version of this machine – which is actually more common in the UK – but it has the slight drawback that the knees can move on their pad, which can introduce a little reduction in range of movement. This is exercise M39 in my ABC7 System. I’ve discovered this great new diet that I really want to recommend to everyone today. Discovered by the Dutch diet institute ‘Het Lapri Loof’, you can lose masses of bodyweight with just a simple gym exercise. One problem is that it can reappear suddenly, so its important to keep alert! See it in action in a short video by clicking here. 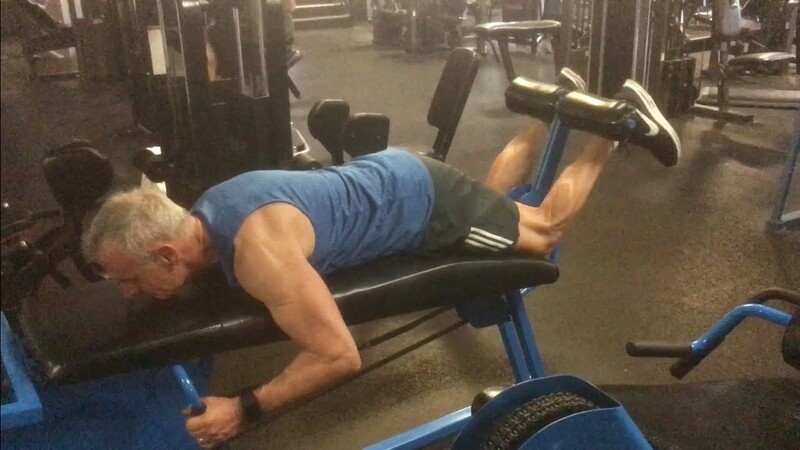 My favourite isolation exercises for the upper legs are – without doubt – leg extensions and prone curls (for quads and hamstrings respectively). And at Golds Venice, they have two of the most vintage machines in existence for these exercises – far larger than today’s equivalent; an idea of the age is that the linkages to the weight stack is by chain. These both date to the original founding and location of Golds from 1965 and I love the vintage feel. Why a Blue Golds day? They are both blue and I specifically wore blue to match – OCD or what? The most complex gym machine? I’ve met a lot of lat pulldown machines in my gym visits around the world doing back workouts, but this one is the most complex I’ve seen. I’m still to work out the benefits of the unique movement, but until then, I just enjoy the ride – literally! Click here to see it in all its glory. Do you agree?